The Narthex is The Basilica’s main entrance. Previous roof and wall leaks, which have since been repaired, and decades of votive candle smoke have taken their toll on the decorative interiors of this space. In the course of this project, the limestone walls were cleaned, returning them to their lighter original patina and brightening the space. Some stone repair was needed, including grouting and tuck pointing, which will have a visual as well as a structural impact. The ceiling paint was gently restored to its original beauty, including the decorative gold leafing. Minor plaster repair was performed to the areas in the ceiling affected by previous trapped moisture. Restoration on the Narthex, a project funded by the Partners in Preservation grant The Basilica community was awarded after the Facebook contest. Thank you to all who voted every day to help The Basilica Landmark win the grant to restore the Narthex. Be sure to check out the amazing and beautiful work the next time you visit. Construction was completed in April 2012. The Sacristy is a special place at The Basilica. It is where vestments, sacred vessels and other cherished items are kept. Most importantly, it is where clergy meet and prepare for Mass and other various functions that take place here at The Basilica. Sacristy restoration included lighting upgrades, stone and plaster repair and improved vestment storage. Previous roof and wall leaks, along with decades of votive candle smoke have taken their toll on the decorative interiors of this space. 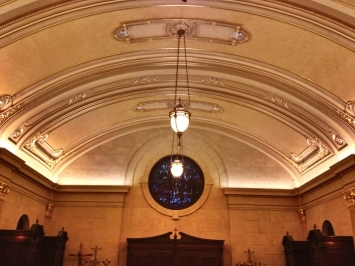 The ceiling was repaired and painted with layers of Palladium and gold leaf ranging from 2 Karat to 24 Karat. 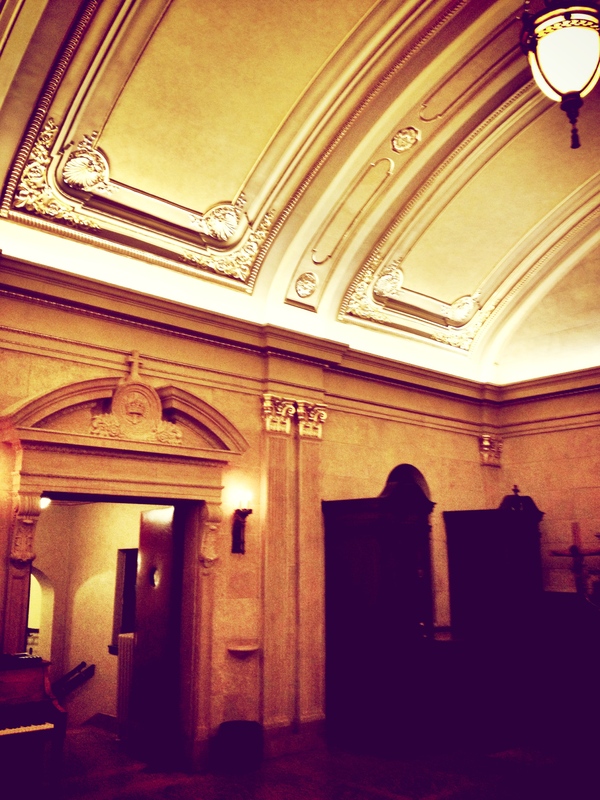 The range of gold leaf is used to give the ceiling work depth. This project was made possible because last fall, the Basilica received a grant for restoration work from Partners in Preservation, a partnership between the National Trust for Historic Preservation and American Express. Based on the meticulous research and extensive on-site analysis already completed by The Basilica’s staff, general contractor and specialist subcontractors, this project will meet the highest standards of historical preservation work in accordance with the Secretary of the Interior’s Standards for the Treatment of Historic Properties. Though this project includes the full restoration of the Narthex and the Sacristy at a later date, it is part of a larger effort for future restoration of The Basilica’s entire interior. The damage in these areas is also apparent in the main church sanctuary. The Narthex and Sacristy restoration will be a visual sample to indicate how the church’s interior could look after restoration. Construction was completed in August 2012.